It would have been all the better, as it seemed to Alice, if she had got some one else to dress her, she was so dreadfully untidy. 'Every single thing's crooked,' Alice thought to herself, 'and she's all over pins!--may I put your shawl straight for you?' she added aloud. She looked at the Queen, who seemed to have suddenly wrapped herself up in wool. Alice rubbed her eyes, and looked again. She couldn't make out what had happened at all. Was she in a shop? And was that really--was it really a SHEEP that was sitting on the other side of the counter? Rub as she could, she could make nothing more of it: she was in a little dark shop, leaning with her elbows on the counter, and opposite to her was an old Sheep, sitting in an arm-chair knitting, and every now and then leaving off to look at her through a great pair of spectacles. The shop seemed to be full of all manner of curious things-- but the oddest part of it all was, that whenever she looked hard at any shelf, to make out exactly what it had on it, that particular shelf was always quite empty: though the others round it were crowded as full as they could hold. 'Can you row?' the Sheep asked, handing her a pair of knitting- needles as she spoke. 'Yes, a little--but not on land--and not with needles--' Alice was beginning to say, when suddenly the needles turned into oars in her hands, and she found they were in a little boat, gliding along between banks: so there was nothing for it but to do her best. So the boat was left to drift down the stream as it would, till it glided gently in among the waving rushes. And then the little sleeves were carefully rolled up, and the little arms were plunged in elbow-deep to get the rushes a good long way down before breaking them off--and for a while Alice forgot all about the Sheep and the knitting, as she bent over the side of the boat, with just the ends of her tangled hair dipping into the water--while with bright eager eyes she caught at one bunch after another of the darling scented rushes. What mattered it to her just then that the rushes had begun to fade, and to lose all their scent and beauty, from the very moment that she picked them? Even real scented rushes, you know, last only a very little while--and these, being dream-rushes, melted away almost like snow, as they lay in heaps at her feet-- but Alice hardly noticed this, there were so many other curious things to think about. 'Was it? I didn't see it,' Said Alice, peeping cautiously over the side of the boat into the dark water. 'I wish it hadn't let go--I should so like to see a little crab to take home with me!' But the Sheep only laughed scornfully, and went on with her knitting. 'To buy!' 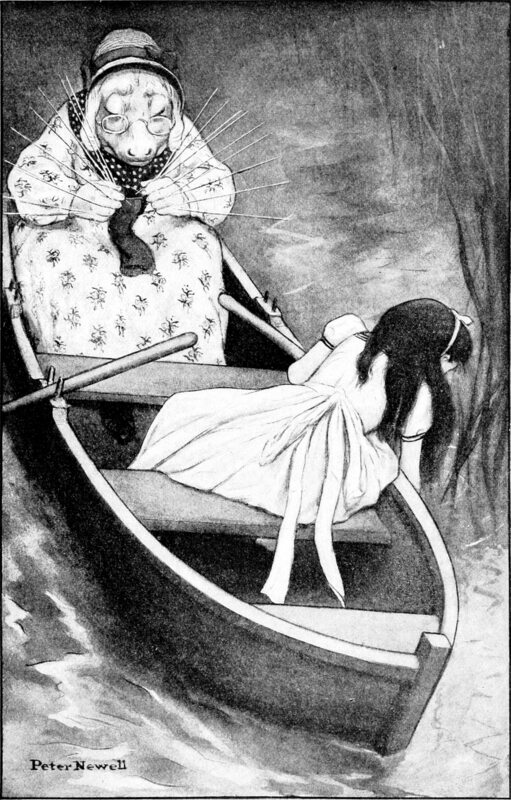 Alice echoed in a tone that was half astonished and half frightened--for the oars, and the boat, and the river, had vanished all in a moment, and she was back again in the little dark shop. 'Fivepence farthing for one--Twopence for two,' the Sheep replied. The Sheep took the money, and put it away in a box: then she said 'I never put things into people's hands--that would never do--you must get it for yourself.' And so saying, she went off to the other end of the shop, and set the egg upright on a shelf.